Adam lay with his wife Eve, and she became pregnant and gave birth to Cain. She said, "With the help of the LORD I have brought forth s a man." Later she gave birth to his brother Abel. 'Then the LORD said to Cain, "Why are you angry? Why is your face downcast? If you do what is right, will you not be accepted? But if you do not do what is right, sin is crouching at your door; it desires to have you, but you must master it." "The LORD said, "What have you done? Listen! Your brother's blood cries out to me from the ground. Now you are under a curse and driven from the ground, which opened its mouth to receive your brother's blood from your hand. "When you work the ground, it will no longer yield its crops for you. You will be a restless wanderer on the earth." But the LORD said to him, "Not so; if anyone kills Cain, he will suffer vengeance seven times over." 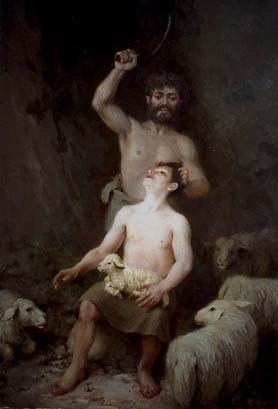 Then the LORD put a mark on Cain so that no one who found him would kill him. "So Cain went out from the Lord`s presence and lived in the land of Nod, east of Eden.